Poet, storyteller, playwright and French politician, born in Besançon (in the Department of Doubs) on February 26, 1802 and died in Paris on May 22, 1885. Author of a vast, bright and varied literary production progressing with singular fluency and originality by the most diverse genres, is regarded as one of the poets of the French lyrics of all time, and one of the most illustrious propagators of the romantic aesthetic by all the Literatures of the world. In the last days of the reign of the Bourbons, Victor Marie Hugo pointed out in a brilliant way in liberal opposition, in defence of universal suffrage and freedom of the press. Then joined the monarchy of July 1830, he/she was appointed the Academy individual and pair of France. Verified the revolution of 1848, was elected Deputy of the constituent Assembly and of the legislative, and although at first it appeared between the conservative party, the reactionary of the majority of the second house spirit made him go completely to the extreme left. His speeches on major legislative issues produced the greatest enthusiasm and admiration. Announced and, like many others, wanted to stop the coup that destroyed the freedom in France in 1851, and when this took place, formed part of the Board's resistance, which endeavoured to hold the public spirit in Paris, during the massacres of the first days of December. Considered the great Patriarch of French literature and from your participation as a member of the Academy and the Senate, Hugo never left its leading role in the social, political and cultural life of France. His first novels, as well as his Odes, ballads and dramatic works, soon placed among the first writers of his time. All their production warns on defense in favour of disadvantaged social groups and their progressive approach to progressive ideological positions. His novel the last days of death (1829), a deep horror against the death penalty, which he/she did not cease ever fight it spread to every encouragement. The play Hernani, premiered in 1830, is the clearest example of the romantic budgets against monarchical conservatism and for were and democratic ideals. With our Lady of Paris (1831), his definitive consecration novel, Hugo wanted to show the soul of the monuments, synthesis of history and legend. In another of his most representative works, Les miserables (1862), the protagonist represents his multiple reincarnations of the shadow of a will stronger than evil and spiritualism as a foundation for moral behavior throughout. In the book of poems lies the legend of the centuries (1859-1883), Hugo approaches history, from Genesis up to the date of their publication, such as a huge epic, in accordance with a fantastic approach and a full formal development of verbal and rhythmic resources. Born in the bosom of a wealthy middle class family - her father, officer of the French army, reached the grade of general between Napoleonic troops and served as Governor military Avila during the invasion French--lived a turbulent childhood and travel, sometimes beside the general Hugo (which accompanied in their military destinations in Corsica and Spain) and at other times in Paris, in the company of his mother and siblings. During these compasses initials of his life, Victor Marie little studied in his native Besancon, in the best schools in the French capital and seminary Nobles of Madrid (1811-1812), where, at ten years of age, was educated to serve as page to the King José I Bonaparte (1768-1844). The fall of this grotesque monarch after the defeats French at Arapiles (July 22, 1812) and Vitoria (21 June 1813), Victor Hugo returned to France and settled definitely in Paris, where just had moved her cultured mother, in whose house he/she lived refugee general Lahorie (opposition to the Empire, Godfather of the future poet and)in fact, partner of Madame Hugo, separated from her husband for several years; Kedar, which would end up being arrested and shot, was the "ideal father," the young Victor Marie, no friend of military severity of his real father). During the periods of his childhood and adolescence he/she spent next to his mother, he/she received this a remarkable stimulus to delve into the culture of its innate vocation literary, so patent on it from his early youth that, in 1816, had left its firm determination to be expressed in a school notebook, someday, "Chateaubriand or nothing". Only a year later, when the young and precocious poet had just turned the three decades of existence, the French Academy honored with an honorable mention one of their new poetic compositions, recognition that definitely encouraged him to direct all their professional and intellectual travails toward literary creation. Settled in Paris and considered, in forums and artistic and intellectual cenacles of the gala capital, as a true enfant prodige of literature, he/she renewed his early reputation in 1819, thanks to the conquest of the Crown of laurel in the floral games of Toulouse. These early poems of Victor Hugo accused inherited realistic aesthetics of maternal tastes, although soon their juvenile concerns was commissioned to print a sudden turn to the work of who, by written until then, was known as "the Bard of the Bourbons". Their full incorporation into the literary landscape of his time was consolidated in that same year of 1819, when his daring spirit led him to found - in collaboration with his brothers Abel and Eugene - the magazine Le Conservateur Littéraire, publication in which saw the light of other poems of Victor Hugo who, together with new compositions from his pen, were eventually collected in his first book of poemsedited in the early 1920s under the title of poésies diverses Odes (Odes and various poems, 1822). The happy journey of his early literary career was overshadowed, in those years, with serious disagreements in the bosom of his family, caused by the rejection of her mother to join in marriage with the young Adèle Foucher. The sudden death of Madame Hugo caused the poet approach to religious spirituality, under the direct influence of the philosopher Félicité Robert de Lamennais (1782-1854), who had converted to Catholicism and ordained a priest in 1816. Released, therefore the veto maternal and advised by Lamennais, he/she contracted finally nuptials with Adele, which gave rise to a new family problem, as his brother Eugène, who was in love with the young woman suffered a kidnapping of madness as a result of the link and had to be admitted to a mental hospital. To aggravate their plight within his own family, at that time became more apparent than ever bad relations between general Hugo and his son, who rejected the ideology of his father and recriminaba him his direct involvement in the Napoleonic policy. Not allowed, however, that these family problems are lodged in the progress of his literary career, notably in 1823 with the publication of his novel to Iceland (1823), work that showed its capacity to the cultivation of the prose, while announcing his progressive approach to the postulates of the emerging romanticism. It was, by then, well known for his journalistic collaborations published in the rotating main and magazines from France, as well as by a strong lyric production which increased the following year of the publication of his first novel, with other poetic delivery entitled Nouvelles odes (new Odes, 1824). Reconciled, finally, with his father, in 1825 he/she meant by his verses of exaltation to the coronation of Carlos X (1757-1836), younger brother of Luis XVI (1754-1793) and Luis XVIII (1755-1824), and last monarch of the House of Bourbon in France; These classroom poems and the "Bard of the Bourbons" heroic was also in his assimilation of the romantic aesthetic, in which Victor Hugo as one of its greatest exponents and, even, as his main head visible in the middle of the third decade of the 19th century, when the printing press gave her second novel, was soon designated Bug Hargal (1825), a revolt of black in Santo Domingo people-centred. Thereafter, it was his interest in the anonymous victims of history and his on defense of disadvantaged social groups, as well as his radical approach to the progressive ideological positions. But the definitive consecration of Victor Hugo as the most outstanding romantic writer of his generation took place in the second half of the Decade of the 1920s, with the appearance of his poems, Odes et ballades (Odes and ballads, 1826) - which for the first time devoted a few verses to the already historical figure of Napoleón Bonaparte- and above all, with the premiere of his first play, Cromwell (1827), a splendid historical drama in verse that sat the canonical models of genre and spread, from its famous "preface", aesthetic and ideological postulates of this vast and fecund movement that would spread throughout Europe and much of America, almost throughout the 19th century, under the name of romanticism. In such introduction, the writer of Besancon declared its special valuation of history as a source not only of knowledge but also of literary treatment susceptible to arguments; and it elevated mode generic romantic drama to the category of imago mundi, since, in his opinion, pointed contrasts that characterized this vehicle of expression literary, always oscillating between the comic and the tragic, underlined this grotesque vision of life that, by that time, had begun to take possession of the Western man. As the formal aspects are concerned, the drama Cromwell also left patent the opening of the romantic taste towards new experimental attempts to governed by the thirst for freedom that encouraged the first cultivators of this trend, captured here in a verse novel, at once lyrical and epic, breath breaking fixed barriers of traditional metrics to serve freely of prose-specific resources. The unequivocal defense of "freedom in art" printed in the "preface" to Cromwell, as well as other fundamental ideas of this paradigmatic text - as the definition of that time from the declared conflict between the spiritual aspirations of the man and his imprisonment in the flesh of the body-again to succeed in the following poetic delivery of Victor Hugo, Les Oriental (the Eastern1828), a collection of lyrical compositions that gave faith of assimilation, from contemporary letters, that admiration for the Eastern culture that had already seized by historians, archaeologists and painters - including Eugène Delacroix (1798-1863). Only a year later, Victor Hugo returned to to demonstrate the spirit of liberal with the publication of Les derniers jours d' a condamné (the last days of death, 1829), a short story in which, in line with its firm rejection of capital punishment, already famed writer of Besançon exhibited his moral and ideological affinity with the doctrine of the first utopian Socialists; and, in the course of that year, encouraged by the success of Cromwell, concluded his second play, Marion Delorme (1829), based on the life of a French courtesan of the 17TH century, whose release was delayed by censorship due to progressive bias that had taken the writing of the erstwhile "Bard of the Bourbons". It could not, on the other hand, rigid zeal of the censors with the iconoclastic force of Hernani (1830), Victor Hugo, third drama directed openly against the thematic and formal models of outdated institutional theater, seriously damaged the classical conservatism of the Comédie Française and gave way to the joyful emergence of a generation of romantic dramatists excited by the new theatrical proposals of Victor Hugo. Meanwhile, the eventful political life in the France of that period, marked by the liberal revolution of July 1830 and the overthrow of the last Borbón King, encouraged the progressive eagerness of the writer of Besançon, who adhered to the proposed reform taken immediately by Luis Felipe of Orleans (1773-1849), the first constitutional monarch. In this period of change, the love life of the still young author was convulsed by new concerns that caused the first disagreements with your spouse, which began to move away while it engaged in the writing of his first great novel, Notre - de Dame de Paris (our Lady of Paris, 1831), work in which, under the pretext of the story of a passionate love affairI went back to show his interest in the exhumation of the story, in this case summarized in one of the most representative of the gala capital. Consecrated, thanks to this novel, as one of the great French writers of that time, Victor Hugo continued squeezing her fruitful inspiration to fill the libraries of numerous poems, stories and plays that made him the national author most prolific and well known during the Decade of the 1930s. The mixture of their personal experiences with the analysis of the political situation was well reflected in some collections of poems as notable as Feuilles d'autonne (leaves of autumn, 1831) and Les chants du crépuscule (songs of twilight, 1835), which soon were joined by-after the final break with Adèle Foucher and entry into their lives of Juliette Drouet - other collections of verses as Les voix intérieures (inner voices1837) and Les rayons et les ombres (rays and shadows, 1840), in which the new literary language of romanticism allowed him to not only rewrite its own indoor adventure, but also to propose a new civic and social morality. At the same time, its valuable and applauded dramatic production increased with new titles focusing on this evocative interpretation of the historical past, as Le roi s'amuse (King sports, 1832) - which would have to foot, almost twenty years after its premiere in Paris, the famous operatic version of Verdi (1813-1901) entitled Rigoletto (1851)-, Lucrèce Borgia (Lucrecia Borgia, 1833), María Tudor (1833)Angelo, tyran de Padoue (Angelo, tyrant of Padua, 1835) and Ruy Blas (1838). And he/she was, in the midst of this incessant theatrical activity, also enriching his narrative production, which added in those years novel Claude Gueux (1834), in which, using the story of a marginal man that just being guillotined, went to denounce the miseries of Western society, increasingly more insensitive to the misfortunes of the less favoured by Fortune, and focused his criticism on the criminal justice system of the France of his time. It was thus increasingly evident in his writing that political and moral conscience decision that drove him to leave a literary testimony of any public event of some social impact, such as the return to France of the ashes of Napoleon, that inspired the text of Le retour de L'empereur (the return of the Emperor, 1840); and, at the same time, remained leaving constancy in his works of its own vital vicissitudes, enriched in the early 1940s by a long trip by Central Europe in the company of his beloved Juliette, which gave rise to the volume entitled Le Rhin (the Rhine, 1842). But a serious creative crisis and spiritual was awaiting him on his return to France after this pleasant tour, initiated by the dismal failure of his theatrical work Les burgraves (the burgraves, 1842), accentuated by the finding of old infidelities of his wife - who had been cheating with the writer and literary critic Sainte-Beuve (1804-1869), friend of the own Victor Hugo -, and definitely rooted in its interior at the end of the summer of 1843, when his daughter Léopoldine lost his life on September 4 in the village of Villerquier, drowned in the waters of the Seine with her husband, Charles Vacquérie. Four stems that had with Adèle Foucher, only two remained alive (Charles Hugo, born in 1826, and Adele, coming into the world in 1830), since the largest of these (Leopold, born in 1823) died shortly after his birth. The discouragement caused by these setbacks, minimally serviced by his election as a member of the Académie Française in 1841, led Victor Hugo to withdraw for some time of literary creation, - on the other hand - absorbed by worldly ambitions and his emerging political career. Their desires for prominence in the public life of France in the mid-nineteenth century were convenience stores in 1845 with his appointment as a pair of France, title that was served to the elections of 1848 and win a seat of Deputy for Paris at the Legislative Assembly of the new Republic. Enrolled in the ranks of the conservative party, he/she supported in principle the candidacy of Luis Napoléon Bonaparte (1808-1873), but little by little it was meaning by a brilliant parliamentary rhetoric that is escoraban to positions as progressive as the denunciation of the miserable living conditions of the marginalized, the defence wishful thinking of universal suffrage or the demands of extreme freedom in the exercise of journalistic activity. Definitively distanced itself from the conservative party, on July 17, 1851 gave a vibrant and inflamed parliamentary speech in which he/she condemned if palliative dictatorial ambitions who would soon be crowned as Napoleón III, and after the immediate coup d ' état carried out by this, was forced to flee Paris abruptly, to seek political refuge on Belgian soilwhere he/she immediately joined the English town of Jersey, accompanied of his family. Fought, then, the drafting of a satirical novel in which, under the title of Napoléon le Petit (Napoleón the small, 1852), attacked violently against the coup Emperor; and recovered the poetic of his youth breath, now clad in a ferocious virulence expression directed against the political situation in his homeland, first deployed in sarcastic runways - thus, v. gr., in his collection of poems Les Châtiments (punishments, 1853) - and, soon after, enriched with strong doses of moral reflection that, starting from his own State of mind, dated back to the dimension of mythical human - like well clear in the poems was of Les contemplations (contemplations1856). Installed, since that year of 1856, in properties that had acquired on the British island of Guernsey (in the channel of La Mancha), continued to denounce the excesses of dictator and rejected, in 1859, the Amnesty offered by Napoleón III himself, continued while producing a brilliant lies poetry that was intended to reflect the path of humanity, in search of the truth, from Biblical times until the time which had been played live - all embodied in poems of later appearance, such as La Légende des siècles (the legend of the centuries, 1859-1883) and the posthumous volumes La fin de Satan (the end of Satan, 1886) and Dieu (God, 1891). At the same time, in his mansion on the island of Guernsey (baptized as Hauteville-House) recovered the drafts of an old narrative project conceived in the Decade of the 1940s, and called to become his masterpiece - after their final editor -: the novel Les Misérables (Les Misérables, 1862). 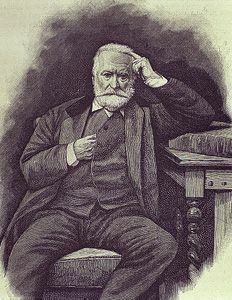 Received with singular enthusiasm by his fellow countrymen, this splendid narration of the already sexagenarian Victor Hugo became regarding aesthetic and moral of a legion of readers who fully identified with the deep spirituality of the poet of Besançon, with their particular vision of the world and its proposals for political and moral regeneration embodied here in a protagonist (Jean Valjean) thatin its symbolic journey through all phases of the recent history of France, just demonstrating that their iron will can prevail over evil forces of evil. After the publication of an excellent essay approach to the figure and work of one of the greatest playwrights of all time (William Shakespeare, 1863), Victor Hugo came to feel attracted by public life, which not prevented him from giving to press new literary creations, such as the novel titled l'homme qui rit (the man who laughs, 1869). On his return to France after the overthrow of Napoleón III (1870), he/she was received between cheers and again elected Deputy, amidst a confusing political turmoil in which were not perfectly defined ideological old writer coordinates, that were well known efforts to improve the living conditions of the most disadvantaged classes. Of new political turmoil were erected at the helm who ruled his steps, soon defeated in the elections following, coinciding with the painful end of the revolutionary movement known as the commune (1870-1871). Desolate, he/she returned to his exile from Hauteville-House to reside there between 1872 and 1873, where he/she wrote L' année terrible (terrible year, 1872), a sour testimony of the idealistic adventure of Miss residents, at a time when all reactionary forces in his country focused their ruthless attacks on figures of the vanquished progressives. Shortly afterwards, turned his eyes - once again - to the past to write the novel Quatre vingt-treize (ninety -three, 1874), inspired by all of the revolutionary movements that had taken place in his country, and specifically focused on the French Revolution and the harsh crackdown unleashed against the insurgents of the Vendée - which took place in 1793, year that gives title to the work -the father of the writer which had taken part actively. His return to France in the mid-1970s was rewarded by numerous honors and recognitions of all kinds, notably his election as Senator for Paris in 1876, since he/she undertook the difficult task of getting an amnesty for the Communards. In full old age, he/she returned to excited about this political activity and felt a new rebirth of his poetic vein, which inspired him some collections of verses as the art of being a grandfather (1879) and four winds of the spirit (1883), which came to joining the edition of the aforementioned La Légende des siècles (the legend of the centuries, 1859-1883)a dazzling exercise of poetic meditation that, full of symbolic elements, cultural references, fantastic views, religious reminiscences and powerful verbal resources, had been brewing for more than twenty years as an extensive mythical epic of humanity, from Genesis up to the date of its publication. In its last years of existence, the fertile Victor Hugo failed to keep that creative fecundity of bygone eras, but nevertheless it left star in the social, political and cultural life of their country, already in their specific hearings in the Senate, already in their not less frequent attendance to the sessions of the Academy on its front page. Erected in the great Patriarch of nineteenth century French literature, on February 26, 1881 - date which was seventy-nine years of age attended, excited, the clamorous ovation from all his Senate colleagues, who posts standing in their stalls, paid you one of the biggest makeshift tributes all those have taken place in this Chamber. It is not surprising that on the occasion of his death, struck in the spring of 1885, the French Government decreed a day of national mourning and organize a lavish funeral ceremony which, among other acts of respectful solemnity, included the exposure of their mortal remains in the Arc de Triomphe in Paris, and his subsequent burial in the Panthéon. Poet inspired and torrential, prolific author of varied lyrical production that was shelling since his early youth until age provecta, Victor Hugo may be referred to today as the creator of jerky, over verses and, not infrequently, artfully reloaded; However, it is undeniable that his poems marked a decisive guidance in the works of his contemporaries, and that his vast and powerful influence, far from limiting its scope to romantic estrus, left a notable mark on the symbolists who came to overcome already outdated thematic and formal models of this current, as Baudelaire (1821-1867), Rimbaud (1854-1891) and, even, Mallarmé (1842-1898). Eloquent testimony to the importance that gained its influence is the opinion of Jorge Luis Borges (1899-1966), who pointed out to Victor Hugo as the most outstanding poet of the 19th century; and even another author so far from the aesthetic and the thought of Besançon as André Gide (1869-1951), writer to be required so mention the name of the best creator of the French lyrics of all time, responded enigmatically: "Victor Hugo, unfortunately...". Despite the evolution of poetic taste started already at the end of the 19th century, Symbolist and Art Nouveau, and prolonged in the following century by the avant-garde movements, many of the poems of Victor Hugo still enjoying some validity in our days, as it can be seen in the reading of one of his most famous compositions: "for egregious cherries / went together to the garden." With her Alabaster arms / climbing the cherry trees, / and montabase in the branches, / that folding the weight. I climbed behind her / and my prying eyes / white leg followed, / and her singing and laughing, / les said with his eyes / my own:-quiescent States! Then to me was leaning, / as bringing teeth / suspended a cherry; / and I my mouth of fire / on his mouth posing; "/ and her, always smiling, / let me cherry / and took my Kiss" ("in the garden"). His other poems, on the other hand, have not resisted over the years or the evolution of the ideas that has been shaping Western thought throughout the 20th century, and can be so obsolete and out of date as the entitled "man and woman", which was, in its time, one of his most acclaimed lyrical compositions: "man is the highest of creatures; The woman is the most sublime ideals. / God made a throne for the man / woman for an altar. / The throne exalted; / the altar sanctifies. The man is the brain, / the female heart. / The brain manufactures light; / the heart produces love. / Fertile light, love is making a comeback. The man is strong for the reason; / the invincible woman by tears. The reason convinces; / tears move. The man is capable of all the heroics; / women of all the martyrs. / Heroism ennobled; / martyrdom sublimates. The man has supremacy; / the female preference. The supremacy means strength; / preference represents the right. The man is a genius; / the woman is an angel. / Genius is immeasurable; / the indefinable angel. The aspiration of man is the Supreme glory, / the aspiration of women is extreme virtue. / The glory makes everything great; / virtue makes the divine. The man is a code; / women a Gospel. The code fixes, / the Gospel perfects. The man thinks; / the woman dreams. / Thinking is to have in the skull a larva; / dream is to have a Halo in the front. The man is an ocean; the woman is a lake. The Ocean has the Pearl that decorates; / the Lake poetry that dazzles. The man is the Eagle that flies; / the woman is the Nightingale that sings. / Fly is to dominate space, / singing is to conquer the soul. The man is a temple; / the woman is the Tabernacle. / Before the temple we discover us; / we kneel before the Tabernacle. / In the end: / man is placed where ends the land; "/ the woman where the sky begins". His other poems of great diffusion are "the graduates for you from the Hill I've cut a flower", "since this world exists", "Never you insultéis to the fallen woman! ", "Already shines the aurora fantastic, uncertain", "He said to his beloved", "beauty and death are two deep things", "I was twelve years old" and, among many others, "I wish you first that ames'. With the release of Cromwell (1827) and the dissemination of its "Preface" developer, Victor Hugo became the father of the most representative of the romantic aesthetic dramatic genre: historical drama. But it was the climb to the stage of the Comédie Française of his play Hernani (1830) - converted then into operatic libretto by Francesco Maria Piave (1810-1876), and premiered with great success at la Scala in Milan with musical score by Verdi (Ernani, 1844) - the cultural event that meant the true consecration of this generic form of drama as main expressive vehicle of the romantic spirit. Since then, a true legion of young playwrights attacked, raging against the rancid Classicist tastes of French institutional theater, and soon their example rippled by many other European countries, which looked at how their most conspicuous scenarios were populated figures and episodes of the past, now rescued as models of a new conception of the world characterized by the insoluble conflict between the spirituality of the soul and its entrapment in a material body. Despite the cruelty of the censors in the Libertines of the protagonist of Marion Delorme (1829) adventures, Victor Hugo continued deploying an intense dramatic activity which, always subject to those specific coordinates of the historical drama, it allowed him to achieve, sometimes, some amazing advances of modernity. So happens, v. gr., in his famous drama Ruy Blas (1838), where one can grasp, avant the lettre, some glimpses of that interest in the intrastory that, many years later, would characterize the literary work of other great European authors. This excellent theater, made piece in a few weeks by a Victor Hugo seized by a febrile creative inspiration, puts on the tables the stratagem of the Minister don Sallustre against the Queen of Spain, who considered last responsible for the mancilla which has fallen on his honor. Ruy Blas Footman will be responsible to carry out the revenge plan hatched by the Minister, which becomes the symbol of the great unknown of the story hidden and powerful force: the common people. In the intention of the playwright of Besançon he/she was the desire to demonstrate that, when the great machinery of the State is ruined and the nobility and the monarchy are anchored in their own misery, still continues on foot, struggling for daily survival, the bold vigour of the most humble. If the premiere of Hernani in 1830, had established an immutable milestone in the history of the universal theatre, the publication, the following year, of Notre - Dame de Paris (our Lady of Paris, 1831) was a real revolution in the narrative of the moment, which thus began to be conceived as a powerful instrument to retrieve the mythical and legendary values of peoples, through the exhumation of his artistic and literary legacies. The beautiful love story starring a priest in love, a deformed ringer and a beautiful woman is nothing more than a plot pretext to show the living presence of the story in the very heart of Paris, in its emblematic Cathedral, where stones and papers of the past raised, in the imagination of the reader, this spirituality of another time that retains its validity in our. Set in the Paris of the end of the 15th century, the first great novel of Victor Hugo tells the story of Quasimodo, a hunchbacked ringer which, by mandate of the Archdeacon Frollo, kidnaps the beautiful gypsy Esmeralda. Learned that Captain Phoebus de Châteaupers, he/she manages to release the girl, that captivated him. But, meanwhile, the King of the beggars has sentenced to death the poet Gringoire in the Court of miracles, and Emerald intercedes for him until he/she manages to save him. Gringoire also is in love with the beautiful gypsy, who, despite follow in love with Captain Phoebus, access to marry him out of compassion. In one of the secret meetings between the girl and the captain, Phoebus de Châteaupers is stabbed death by Archdeacon Frollo, who, for spite and cowardice, allows that the Gypsy is indicted for the crime. Quasimodo, in love with the young woman, also will be responsible for avenging her: when Frollo contemplates impassive to the hanging of Esmeralda from the Tower of the Cathedral, the Bell-ringer throws it vacuum. With the corpse of the Gypsy in her arms, the hunchback goes in search of his own death to the cemetery of the damned. More than thirty years elapse since the appearance of Notre - Dame de Paris until the publication of the second novel of Victor Hugo, Les Misérables (1862), work which, by itself, is enough to book a place of privilege in the universal Parnassus the writer of Besançon. Not concerned about, now, the mature Narrator both loving feelings and the victims of social injustice, embodied in the figure of the protagonist Jean Valjean, an old jail that, after having escaped from prison, falls under the purview of Myriel, Bishop of Digne. Unable to still steal to its destination, Valjean steals two silver chandeliers belonging to his protector, who, when the thief is arrested, intercedes on his behalf in hopes of returning it to a righteous life. With identical purpose of regeneration, Jean Valjean adopts a new personality that allows you to reach the office of Mayor in a town where Fantine, a poor woman seduced and abandoned, is a victim of ill-treatment which the Commissioner Javert gives him. Asserting its new identity, Valjean orders the release of the woman - who is in charge of her daughter Cosette-, what arouses the suspicions of Javert. But, soon after, another "miserable", Champmathieu, is confused with the jail escapee, causing Valjean to confess his true identity so that the accused person be condemned. Dead Fantine, Valjean takes care of her daughter Cosette, who has entered the service of an evil character, Thénardier. Pursued by Javert, escapes several times until all believe that he/she died drowned, so again to adopt a spurious personality - now calls himself Fauchelevent - which manages to save Cosette's harassment of Thenardier. Marius, a young Republican who is in love with Cosette, becomes inseparable companion of Valjean, which takes an active part in the riots of 1832. A haphazard plot of fate, Javert, who has been taken prisoner in this fight, is put in the care of Valjean, who returns to make his moral regeneration gala to the release to its eternal rival. Marius, who has been injured on the barricades, recovers and contracted nuptials with Cosette, what fills the aspirations of Valjean, who had promised the dying Fantine care for her daughter until it well established. Soon after dies the protagonist, with candelabra that had stolen the bishop placed the head of his bed. THISTLE, Regina and CARBAJAL, Roberto Eduardo. Intimidades de Shakespeare and Victor Hugo (Mexico: Plaza and Valdés, S. A. de C. V., 1995). ESCHOLIER, Raymond. Victor Hugo, King of his century (Madrid: Espasa-Calpe, 1975). MEISEL LANNER, Robert. Three teachers who know: Borges, Victor Hugo and Rubén Darío (1994). SIMÓN DÍAZ, José. Victor Hugo in Madrid (Madrid: Consejo Superior de Investigaciones Científicas, 1992). Suarez LEON, Carmen. José Martí and Victor Hugo in the faithful of the currencies (Havana: Ed. José Martí, 1998). VARGAS LLOSA, Mario. The temptation of the impossible (Madrid: Ed. Alfaguara, 2004). VV. AA. Around Victor Hugo (León: Universidad de León.) Service publications, 1987). VV. AA. Victor Hugo. Literature and politics (Barcelona: PPU/UB.) Department of Philology, 1987).